More than half of the largest galaxies in the nearby universe have collided and merged with another galaxy in the past two billion years, according to a Yale astronomer in a study using hundreds of images from two of the deepest sky surveys ever conducted. The idea of large galaxies being assembled primarily by mergers rather than evolving by themselves in isolation has grown to dominate cosmological thinking. However, a troubling inconsistency within this general theory has been that the most massive galaxies appear to be the oldest, leaving minimal time since the Big Bang for the mergers to have occurred. 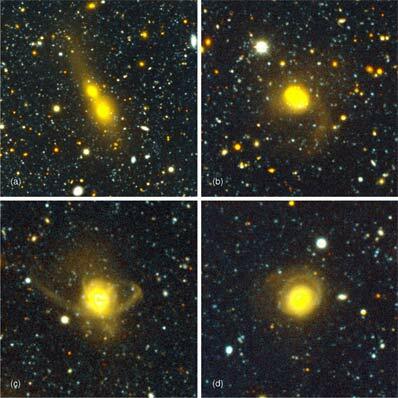 "Our study found these common massive galaxies do form by mergers. It is just that the mergers happen quickly, and the features that reveal the mergers are very faint and therefore difficult to detect," said Pieter van Dokkum, assistant professor of astronomy at Yale University, and sole author of the paper appearing in the December 2005 issue of the Astronomical Journal. The paper uses two recent deep surveys done with the National Science Foundation's 4-meter telescopes at Kitt Peak National Observatory and Cerro Tololo Inter-American Observatory, known as the NOAO Deep Wide-Field Survey and the Multiwavelength Survey by Yale/Chile. Together, these surveys covered an area of the sky 50 times larger than the size of the full Moon and more than 5,000 times larger than the famous Hubble Deep Field. "We needed data that are very deep over a very wide area to provide statistically meaningful evidence," van Dokkum explains. "As happens so often in science, fresh observations helped inform new conclusions." Van Dokkum used images from the two surveys to look for telltale tidal features around 126 nearby red galaxies, a color selection biased to select the most massive galaxies in the local universe. These faint tidal features turn out to be quite common, with 53 percent of the galaxies showing tails, broad fans of stars trailing behind them or other obvious asymmetries. "This implies that there is one galaxy that has endured a major collision and subsequent merger event for every single other 'normal' undisturbed field galaxy," van Dokkum notes. "Remarkably, the collisions that precede the mergers are ongoing in many cases. This allows us to study galaxies before, during, and after the collisions." Though there are not many direct, star-to-star encounters in this merger process, galaxy collisions can have profound effects on star formation rates and the shape of the resulting galaxy. These mergers do not resemble the spectacular mergers of blue spiral galaxies that are featured in several popular Hubble Space Telescope images, but these red galaxy mergers appear to be much more common. Their ubiquity represents a direct confirmation of predictions by the most common models for the formation of large-scale structure in the Universe, with an added benefit of helping solve the apparent-age problem. "In the past, people equated stellar age with the age of the galaxy," van Dokkum explains. "We have found that, though their stars are generally old, the galaxies that result from these mergers are relatively young." It is not yet understood why the merging process does not lead to enhanced star formation in the colliding galaxies. It may be that massive black holes in the centers of the galaxies provide the energy to heat or expel the gas that needs to be able to cool in order to form new stars. Ongoing detailed study of the newly found mergers will provide better insight into the roles that black holes play in the formation and evolution of galaxies. Based in Tucson, AZ, the National Optical Astronomy Observatory (NOAO) consists of Kitt Peak National Observatory near Tucson, AZ, Cerro Tololo Inter-American Observatory near La Serena, Chile, and the NOAO Gemini Science Center. NOAO is operated by the Association of Universities for Research in Astronomy (AURA) Inc., under a cooperative agreement with the National Science Foundation.